Earlier I wrote a report on the rain and snow that halted harvest. I was a little overly optimistic when I said we would be done later in October. Little did I know that the upper level low pressure system responsible for ushering in the poor weather would hang over Saskatchewan until the first week of November. The shift in the weather was welcome news as we have had several sunny days with record breaking warm temperatures. It was like a light switch was turned on and we have finally returned to the sunny dry weather we normally expect here in the southern prairies. The photo above was taken on November 9th at about 1 pm. The temperature was 21 C accompanied with a nice breeze. This flax field withstood all the snow and rain. This flax crop yielded 54 bushels per and produced a pretty good looking sample. There were just a few “leakers” which are seeds that have the seed coat cracked and some oil leaks. These seeds are a little darker and lighter so we will be able remove them with our processing plant. After we are done harvesting the flaxseed we have to deal with the straw. 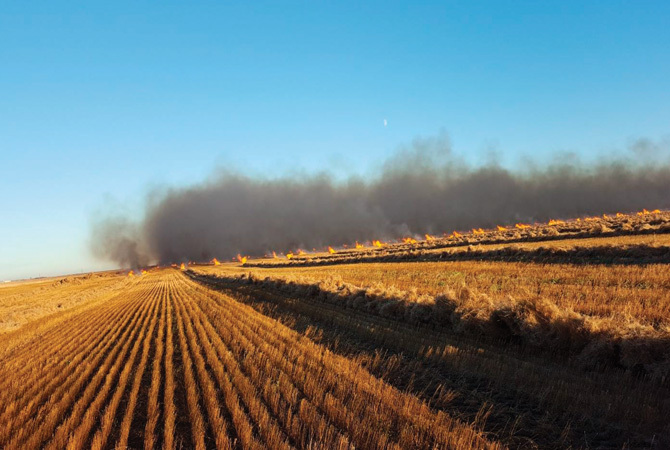 The straw is like a rope with very strong fibre, therefore, we can not work it back into the ground. The only option we have is to burn the straw as seen in the picture above. The other field we had left to harvest was canaryseed. 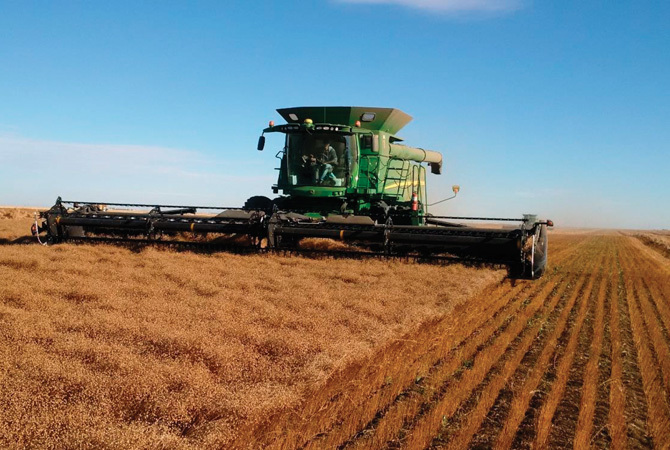 We swathed the canaryseed before the rain and snow. This turned out to be a good decision as snow would have flattened the standing canaryseed and would have presented some challenges harvesting. The canaryseed field will take a few days to complete as there are some wet swathes in the low lying areas of the field. The quality is still pretty good but we are seeing sprouts in the wettest part of the field. 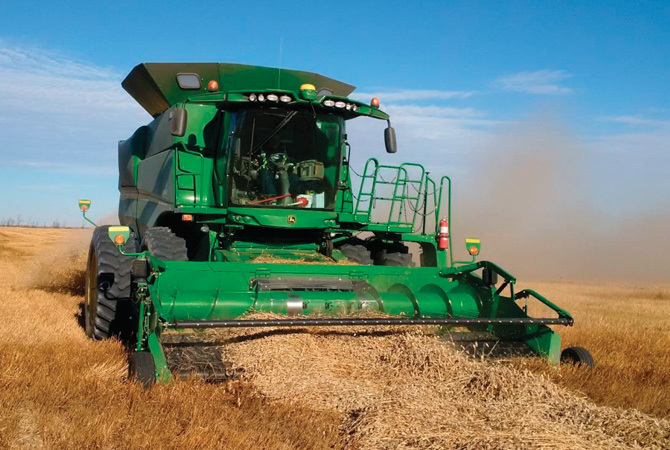 We don’t have the harvested weight at the time of writing but our early estimate is 35 to 40 bushels per acres. 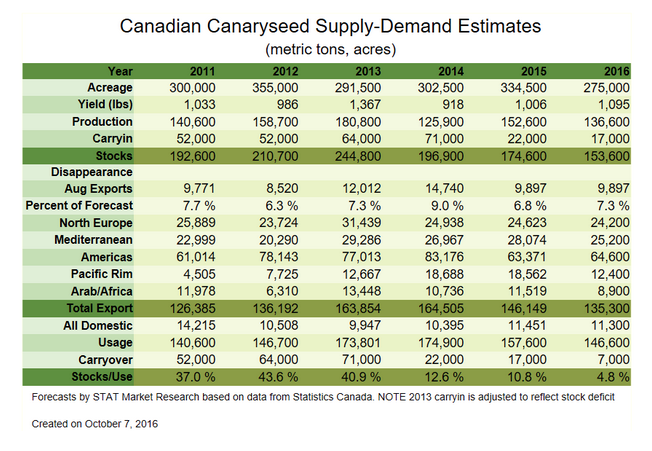 Canaryseed markets firmed up in October with the prospects that 25% or more of the crop would remain in the field for the winter. It now looks like there will be a significant amount of progress on the canaryseed harvest. Bid prices for canaryseed range from 22 to 25 cents per pound. Finally, we can put away the combines, reflect on the lessons learned, and make plans for a better year in 2017.